The crystal clarity of diamonds and the brilliant blue of sapphires seem destined to go together, which might explain the current popularity of diamond and sapphire rings. The juxtaposition of the two types of gemstones can be quite striking, particularly in a ring with a band made of gold -- but diamond and sapphire rings with platinum and white gold bands look plenty sharp, too. Make no mistake -- there's nothing plain about even the humblest diamond and sapphire ring. Nor are they an inexpensive alternative to a "plain" diamond ring -- while there are diamond and sapphire rings to fit almost any budget, you'll find that a decent sapphire can be quite expensive. Why choose a diamond and sapphire ring over a simple diamond ring, then? If their sheer beauty isn't enough, why not because of their adaptability? While diamond and sapphire rings make excellent promise, engagement, and even wedding rings, they're also ideal just for personal adornment or as gifts for someone you love. Just think how nice the white and blue sparklies in your new diamond and sapphire ring will look against your skin, or against your lover's. Not only that, you generally end up with more stones in a diamond and sapphire ring than in a ring that's adorned only with diamonds, so with diamond and sapphire rings you come out on top that way, too. 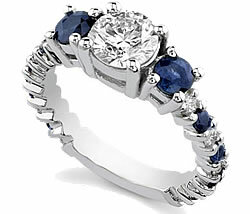 You'll also likely to see more variety with diamond and sapphire rings. For example, instead of a simple central setting, as you might see on a diamond engagement ring, the stones on a diamond and sapphire ring might be alternated in a channel, spaced individually around the ring in bevel settings, or set in an exquisite pattern. Then, too, with diamond and sapphire rings you have the option of which stone you want to dominate; that is, do you want a sapphire ring with a few diamonds, a diamond ring with sapphire accents, or a more balanced mix of both? Among the more striking versions of diamond and sapphire rings are those with a central, emerald-cut sapphire surrounded by smaller diamonds in a square pavé setting; or, a central, round-cut diamond flanked by sapphires the same size or smaller. Of course, there are a million subtle variations, and plenty of other options; you can't go wrong with a diamond and sapphire ring, as long it's sound and you've got quality gems. Recently, diamond and sapphire rings have become popular for wedding and engagement rings, particularly when paired with platinum. Why they've become so popular in the last few years is debatable, but it may have to do with the brouhaha surrounding recent celebrity finger-decorations. While most of us can't afford a six-carat pink diamond like the one Jennifer Lopez once dragged around, if you want some eye-catching bling, you could do worse than a nice, big diamond and sapphire ring. Not only do they look good, they're highly valuable and as radiant as your lover's eyes. There's a reason the sapphire has long been considered the jewel of royalty.